Chancha Via Circuito – a favourite listen in recent years – has a new album out – Amansara (Wonderwheel Recordings). I first discovered his enchanting atmospheres and mixing on his wonderful ZZK Records mixtape (promoting his previous album Rio Arriba). His music seems to thrive best in mixtapes (see also Mixtape Cumbiero European Tour 2013 and a mixtape at Testpressing for new album ), reminding at times of early Future Sound of London and their wandering from soundscape to rhythm and back again. There’s a warmth to this music, and despite a slower tempo, there’s a momentum to it all as well. Recommendo! 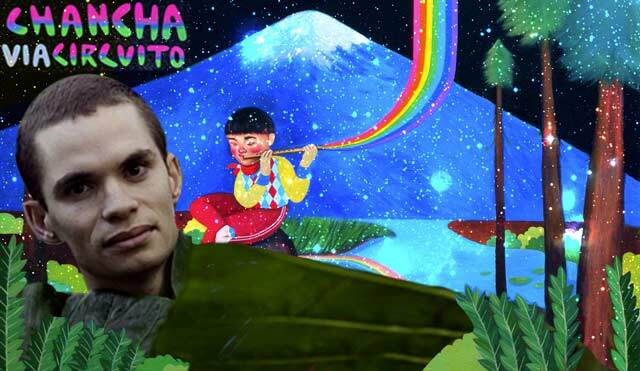 Oh and a special shout-out too, for Paula Duro, who makes the enchanting artwork for Chancha (and featured in the backlayer of the collage above), as well as much of her own cool stuff. Check out her playful cosmic palette at flickr. So I’ve been reading a lot lately. And swimming in words returns me to writing. Or at least – some words about books. The infinite shelves at Goodreads are responsible for the bulk of the book orders above (want to swap recommendations?). I don’t know what took me so long to finally join Goodreads, I’d long been finding it tricky to get interesting book recommendations (particularly – good fiction – compared to say music or movies). Amazon has a decent catalogue, but I’ve found it unreliable for recommending new fiction of interest. 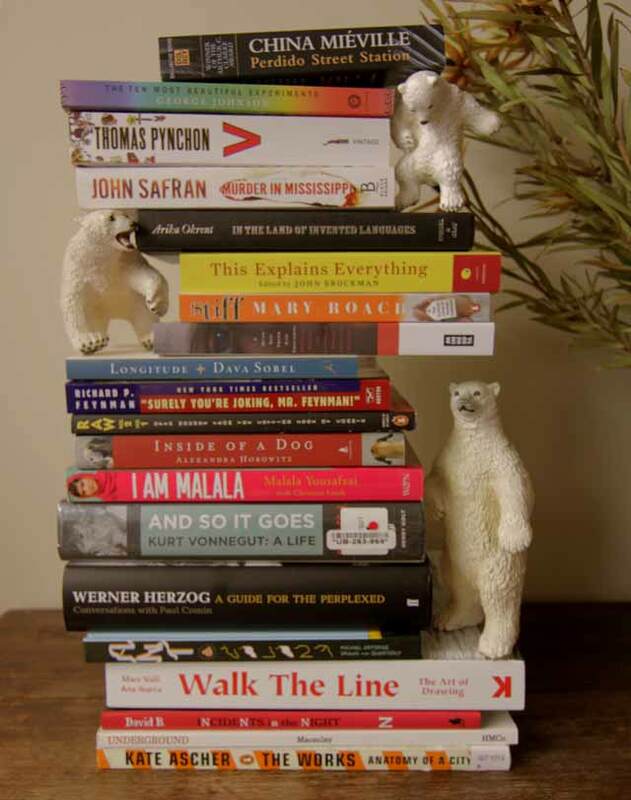 And while I prefer the hand-curation of say – the Brainpickings bookshelf, the McSweeney’s Journal or DJ Rupture’s Mudd Up Book Club (includes a pretty great collection of sci-fi set in non-anglo cities), each of those are a pretty limited lense. Anyways, I seem to have my reading for the next while sorted, which is also going to mean some more words here over time. As real-time video software continues to evolve, we’re starting to see some really thoughtfully considered applications – such as Millumin, by Philippe Charaund, software dedicated to “create and perform audiovisual shows”. 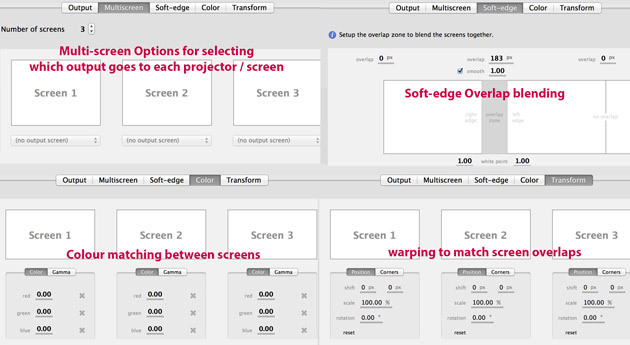 In part, Millumin is possible because of today’s easy re-routing of video between applications (thanks to software such as Syphon on mac and Spout on PC), which has enabled some developers to focus on specialty areas, and allowed others to provide ways of usefully integrating different parts of a video workflow. Where does Millumin fit in? While there are a lot of real-time video tools and specialities available, Millumin’s great strength is as over-arching software – and providing useful ways for co-ordinating and controlling other software ( eg triggering and manipulating clips inside VJ software, and recompositing, mapping and sequencing that video with Millumin, easily jumping between very complex compositions). Millumin will especially be of interest to those seeking to sync media in tightly curated shows eg syncing video with important theatrical cues, conference cues, or a specific sequence of events in a music show. Aside from the time-based controls, it’s also a pretty effective piece of mapping software – which includes a built in capacity to edge blend between projectors. 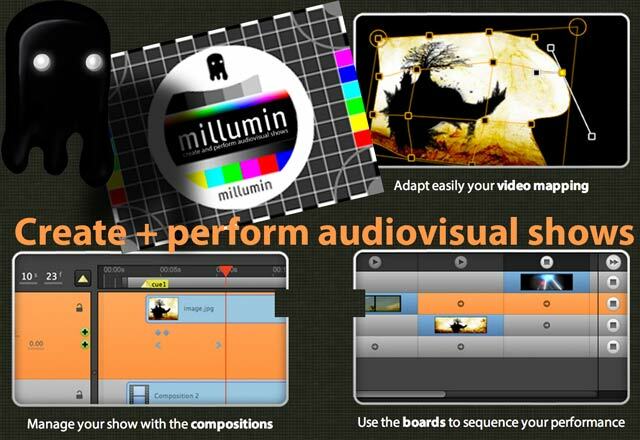 In other words, Millumin provides good control over time (sequencing) and space ( compositing and mapping). It’s a unique recipe – while there are other apps that offer more advanced portions of what Millumin does – eg Vezer‘s sequencing and timeline options, or Madmapper‘s mapping controls – there’s nothing else that quite manages to do what Millumin does. QLab is probably it’s closest competitor, with the strengths and weaknesses of each meaning one or the other will suit your workflow better. 2. Use the Workspace toolbar to move, map, warp, mask … to rotate and scale the layers directly in the workspace. – Also like AE – includes adjustible keyframes – change opacity, position, scale or rotation change over time to specific values. – cue points can be added. 6. Import this Composition into the Dashboard + switch between complex compositions easily. Control of time / sequencing: Millumin’s key-framable timelines will be warmly familiar to everyone who has used video editing software, and tends to find such functions missing within VJ software. 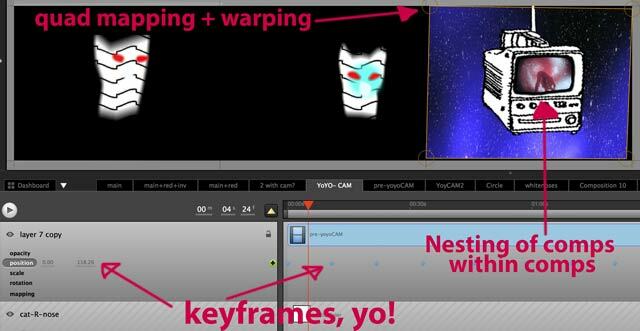 Most VJ software will show a timeline / playhead for each clip – but much more rare is a capacity to place many clips along a timeline, and easily add cue points, and easy linear arrangements. Example nice touch? Drag and drop a clip onto a timeline, then drag the end of it to auto-loop as long as you need. Room for improvement? There are lots of little user interface quirks that could be removed / better designed. Admittedly this is partly because Millumin reminds so much of video editing and compositing software – which brings a whole bunch of fine-tuned expectations – and sets an unfair benchmark – relatively new software made by one person could hardly be expected to match the resources and foundations of established editing and compositing software. .. and these ‘presets’ / ‘dashboard selections’ – can be triggered from other software using midi or OSC – eg the M1-m10 presets built into a VDMX control surface window below. Room for improvement? 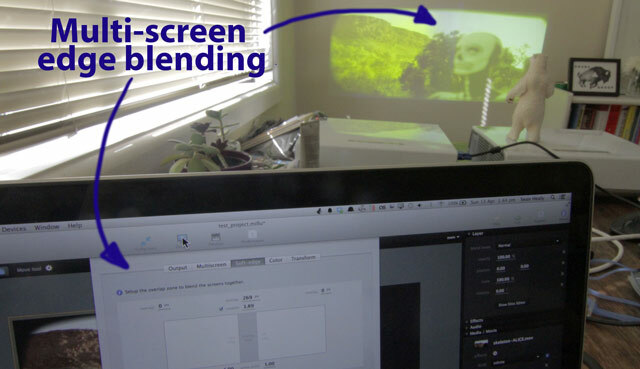 Being able to work better with multiple projectors that have different aspect ratios to each other. As a standalone application, Millumin has a limited range of visual effects. On the other hand – deep syphon integration means easy piping in of video from other software, for sequencing or compositing, and quartz composer integration means being able to easily add customised QC elements, effects and compositions to any of that video piped in. – 599€ (VAT not included) = A license for Millumin on 2 different computers. for 2 computers . Educational and rental pricing available by negotiation. 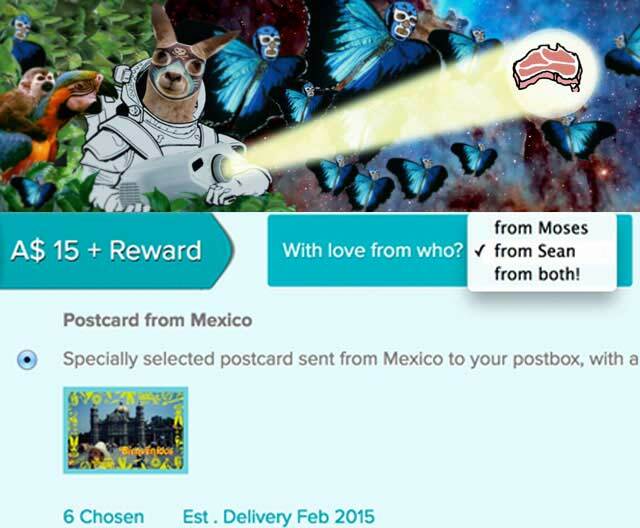 Millumin is very thoughtfully crafted software, with a nicely expanding feature set. And while it’s missing refinement or lacking more detailed control in a few places, it continues to develop and evolve into a fantastic and versatile tool for live video, especially with multi-screen compositing. and lots of examples showing how to take VJ software into Millumin..
– Lotech (NZ) for inspirational use of Millumin @ Splore – each VJ could send a signal into the machine running Millumin, which effectively let them play on a pre-mapped structure, and for ongoing feedback about Millumin over time. – Jem the Misfit (NZ/Aus/Ger) – for highlighting how creatively Millumin could be used for compositing. LOGLINE: The story of legendary cult film director Alejandro Jodorowsky’s staggeringly ambitious but ultimately doomed film adaptation of the seminal science fiction novel DUNE. SYNOPSIS: In 1974, Chilean director Alejandro Jodorowsky, whose films EL TOPO and THE HOLY MOUNTAIN launched and ultimately defined the midnight movie phenomenon, began work on his most ambitious project yet. Starring his own 12 year old son Brontis alongside Orson Welles, Mick Jagger, David Carradine and Salvador Dali, featuring music by Pink Floyd and art by some of the most provocative talents of the era, including H.R. Giger and Jean ‘Mœbius’ Giraud, Jodorowsky’s adaptation of Frank Herbert’s classic sci-fi novel DUNE was poised to change cinema forever. 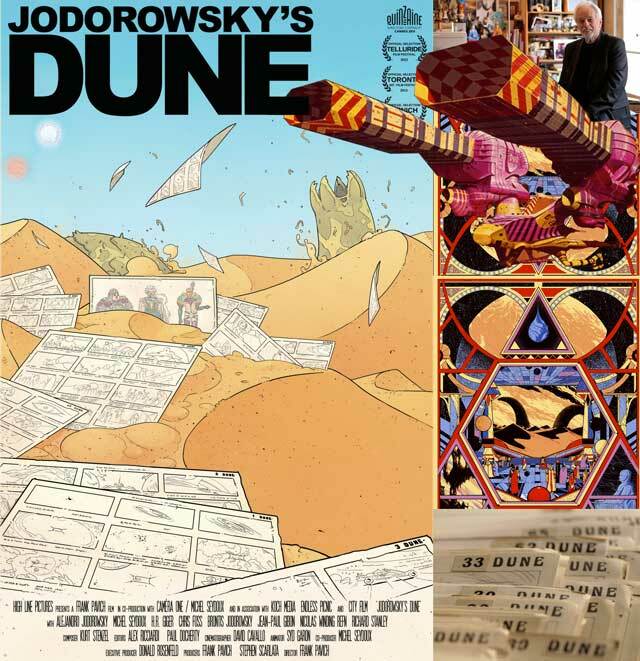 Finally got to see Jodorowsky’s Dune recently (with long-time fan, and comic-book genius, Gregory Mackay, who is is great for detailing the sordid history of sci-fi illustration). 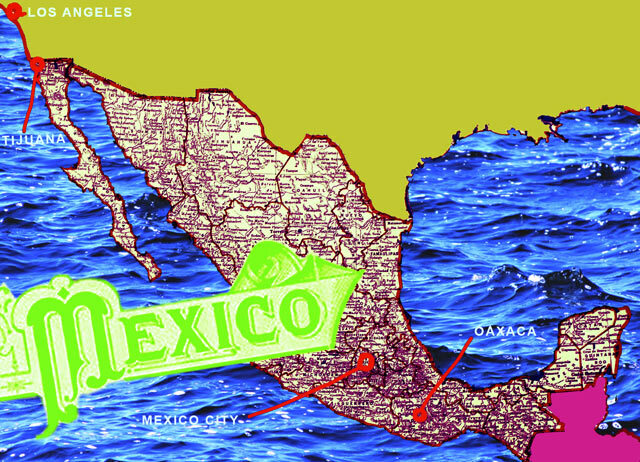 It’s an incredible story of an incredibly audacious and film…. and although that feature never got completed, the documentary shows how lots of the creative energy involved was rewarded elsewhere later. Jodorowsky’s Dune – plays at the Melbourne Film Festival in July 2014. Holy Mountain – another quest for enlightenment, with vast and ambitious set designs… thanks to an increased budget of $1million from a Beatles business associate (John Lennon was a huge fan of El Topo). Following the success and acclaim for Holy Mountain… his next wish was to adapt Frank Herbert’s Dune, as a psychedelic space opera, a spiritual film for transformation… And in 1974 French producer Michel Seydoux offered to finance the start of it. Pink Floyd (to provide the soundtrack.. ) and a cast including.. So the world’s greatest ‘psychedelic space opera’ never got made… but director Frank Pavich did a great job of teasing out the possibilities, ably assisted by the subtle storyboard animations of Syd Garon (director and animator of Wave Twisters, yo!). More importantly though, the director was able to reunite producer Seydoux with Jodorowsky (after 30 years! ), and Seydoux not only co-produced Jodorowsky’s Dune, but also went on to produce Jodorowsky’s first film in over 20 years: Dance of Reality (another incredible film!). Coming soon to WIDE OPEN SPACES, MAY 2-4, ALICE SPRINGS, 2014. 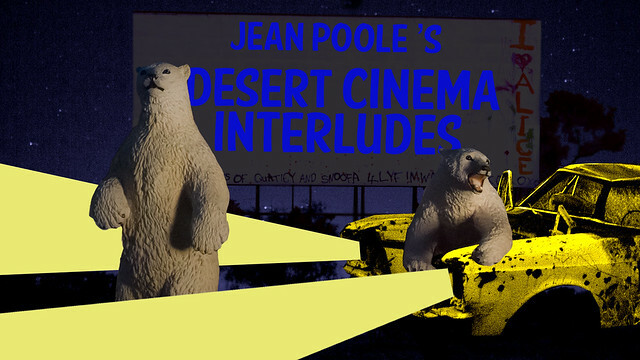 Each live cinema piece will explore footage and soundscapes from one particular landscape, juxtaposed with a range of audio-reactive animated characters and objects, mixed and mutated live. Float briefly in the ambience of luscious forests, lunar-like New Zealand volcanoes, underwater coastal life, and the desert (from footage shot during WoS 2013). Am delighted to be helping host an ACMI workshop on March 1st – with David Lublin (Vidvox co-developer for VDMX). David will be delivering the workshop from New York, with high bandwidth streams of both a video-conferencing computer and his VDMX video output for workshop attendees to view. ACMI will be providing laptops with VDMX pre-installed, although people are welcome to bring their own. This is an incredible opportunity to hear about VDMX from a core developer, and get inside knowledge about real-time video manipulation. Tickets are limited for the workshop, +pitched at a video-artist friendly $25. Book via ACMI. Comments can be left by online viewers, and there will be a dedicated section at the end, where online questions will be answered by David. 2-2.30 Questions + Answers / with workshop attendees + questions from online viewers. 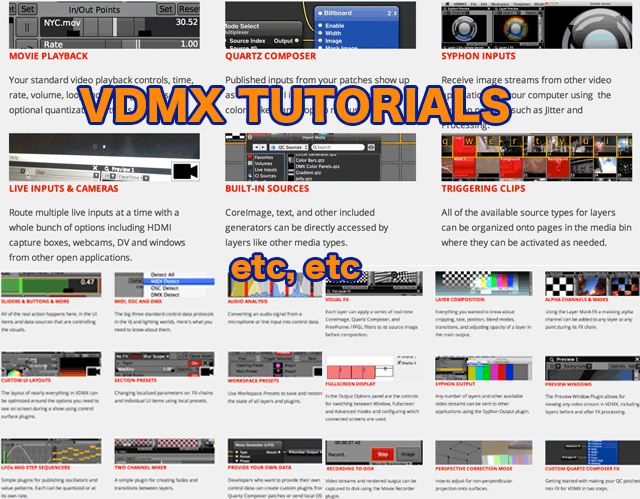 Pre-workshop advice: have a browse through the extensive range of VDMX tutorials that’ve been published in the last 6 months, there’s a real wealth of VDMX knowledge available: introductory tutorials, arranged by topic // and a full list of tutorials including lots of novel uses and recent enhancements. See also: VDMX developer blog / VDMX online forums. Bonus Round: Check out David’s midi dogs + game of phones). See below – or click here to view in youtube, and read the comments contributed by the 50+ concurrent viewers. - Photos from Boinga-Bob's Temple. Scattermish and myself recently tackled the Lilydale to Warburton rail trail, a 40km stretch of bushland cycling, an hour outside of Melbourne. “Rail trails are shared-use paths recycled from abandoned railway corridors. Rail trails link big and small country towns and meander through scenic countryside just as railways did in the past.. Railway engines have always had difficulty climbing hills. The steepest grade of a railway line is never more than 1 in 30.. no sharp rises and no sharp bends, just sweeping curves and gentle undulations.. abandoned rail lines make superb pathways for walking and riding.” – Rail Trails Australia. The ride itself is awesome – it’s a gorgeous, mostly tree-shaded ride, with plenty of great views, though Warburton has no station, so you need to plan for an 80km round trip from Lilydale. The Warburton end makes it all worthwhile – with the cute bicycle themed Cog Bike Cafe greeting riders at the end of the ride, and just nearby… jutting out from the trailside foliage – the temple of Boinga Bob, a sprawling marvel of DIY architecture and evolving artwork installations. I’ll let the temple photos speak for themselves. Boinga Bob was home at the time, and is quite the interesting character. He happily entertained a few guests with tales of his extensive adventures on various islands and mountain tops over the years. Currently though, he is facing a battle with the local council who want to destroy his temple. Drop him a line if interested in helping, or join the Facebook group to save Boinga Bob’s temple. Next up: The Great Victorian Bike Trail. Above – a motion graphic medley made from clips I created recently for each song of Audego‘s latest album, Beneath the Static and the Low. It’s pretty gorgeous music, listen for yourself – bandcamp / soundcloud / itunes. The Audego brief: ‘retro-abstract motion graphics we can project behind us while we play’. After Effects + Premiere – for compositing, effects and editing. Canon 7D – for filming of above projections. 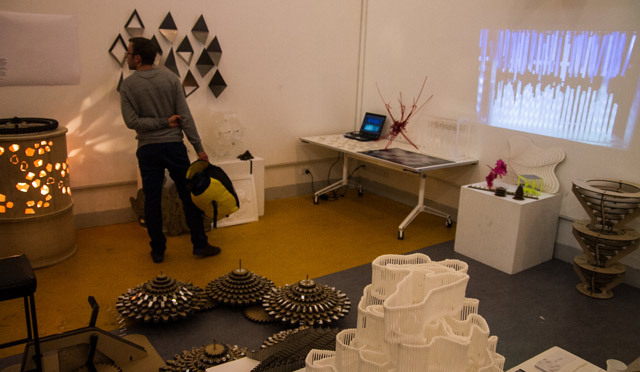 Over the past three semesters I’ve had the pleasure of co-steering a studio elective with Caroline Vains, for Interior Design students within the school of Architecture and Design at RMIT. 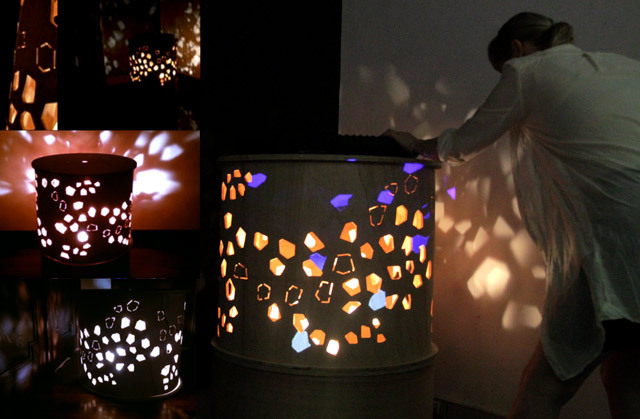 Loosely – we’ve been exploring the intersection of video projection, built objects and interior design. 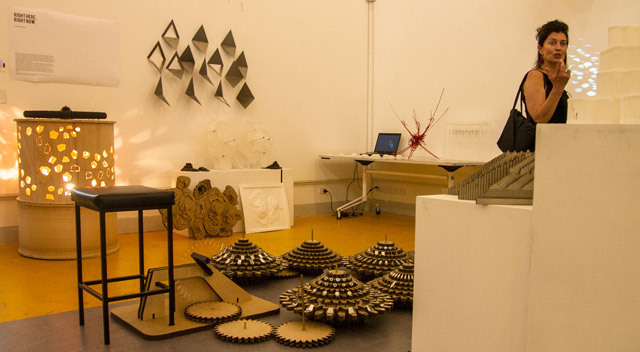 Most interior design students are already highly visually literate, great at quickly visualising their ideas in many ways, and unlike most video oriented people I know – are fantastic at working with materials and constructing models. As well as adapting very quickly to the world of projected video, they also bring along considerable materials testing, research and construction skills. This semester though, we added interactivity as a requirement. In addition to learning video editing, video composition, animation, and projection mapping – they needed to think about how they would include some simple lo-fi interactivity in their projects. It’s quite satisfying to report that they responded wonderfully to that challenge, and I’m happy to share some of those efforts below. (Course Document (PDF) and readings / 12 weeks of related blog posts). 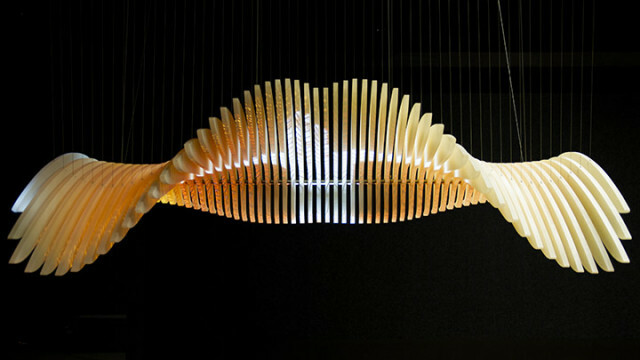 Pictured above – the crowd-pleasing bicycle powered installation by Jimmy Liu, David Dai and Nick Hsu. (‘Team Brothers!’ ). A series of reflective gears were connected to pedals and a bicycle seat, causing the carefully mapped projections to reflect around the space. 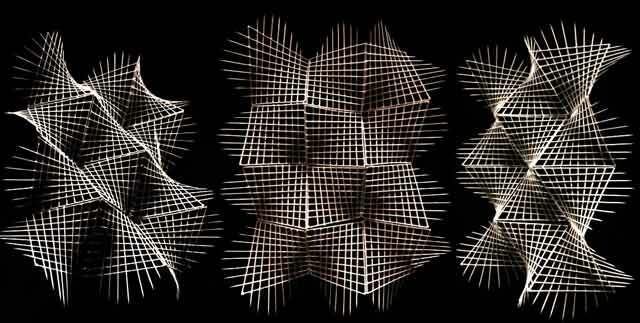 This was a nice evolution from their earlier experiments which included tight geometric mapping sequences, and three dimensional arrangements of laser-cut paint splashes. .. while Jacinta Birchmore explored repetitive forms and texture, beginning with the intricate model below, before iterating through other shapes and surfaces. Together for their final piece – they continued to explore scuba diving, but took it in a new direction, creating a breath activated installation. Their structure featured a layer of styrofoam balls which obscured the projector light from shining through, unless someone blows through the mouthpiece – which scatters the balls and enables the animation to bounce around inside their mirrored space (a process accentuated by a breath-powered spinning reflector ). Guest blower: Ramesh Ayyar. 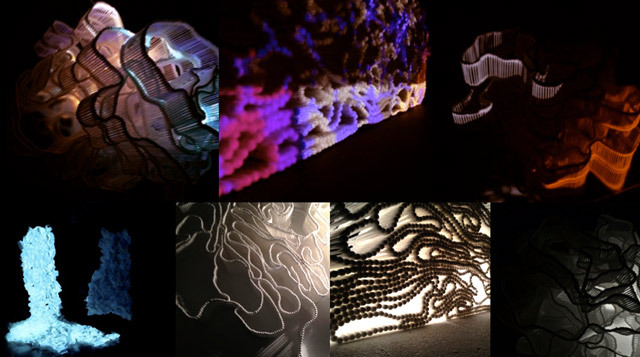 Another blending of approaches: Stacy Rich’s topographies and Danielle Bird’s organic textural work..
.. later combined to produce a quite beautiful structure (which unfortunately had a few interactive / mechanical problems). Together that trio diligently combined their efforts to produce a wooden bicycle work – which featured a pair of revolving wooden cylinders, each with precision cut holes, and a bicycle wheel on top for spinning the cylinders, altering the light patterns being emitted from within. Aside from the prowess with construction, another trait interior design students seem to share – is a flair for dynamic documentation, very comfortably playing with formats and materials to best express their projects. Below, a couple of examples by Stacy + Jimmy. Below, the projects grouped as part of the final exhibition … (note the bicycle pedals for activating the ‘Team Brothers’ piece at the top of the page). Thanks to Caroline and the entire studio for a great semester! 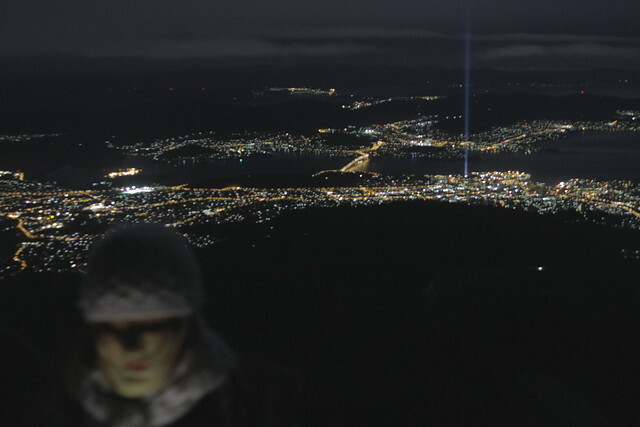 … All of which were made irrelevant by Ryoji Ikeda‘s 5KM HIGH BEAM OF LIGHT INTO THE SKY ( aka ‘Spectra‘). Simultaneously over at the gallery, Ryoji exhibited his Datamatics work. Really enjoyed this more than expected. It’s a very well documented and promoted work, but none of that captures the oddly calming oceanic presence it has. Elsewhere, Batgirl battles Ryoji in animated GIF format. Ivana Franke – “We Close Our Eyes and See A Flock of Birds” -A cyclinder shaped room, with central seating, facing out against LED covered curved walls, which proceed to strobe and flash their way through a range of sequences. Anish Kapoor – “Imagined Monochrome” – An artwork experienced one at a time – because it involved laying down and having your *eyeballs* massaged by a professional eyeball masseuse. I missed getting an appointment for this, but apparently it was fantastic. .. And Dark (Faux Mo). MONA FOMA 2013, the summer edition.. held in a Hobart laneway, where I projection mapped animations onto a 4 storey fire escape (painted white). (eg Composite multiple video sources, Image Masking, Pre-framing video into compositions, Working With Layers from Photoshop, Nesting + Pre-composing in AE, Inverse Kinematics￼, camera paths.. etc). Would love to hear from anyone with questions (about something that isn’t clear) – or suggestions ( how to clarify a concept better, or other animation concepts that could be included etc ). A Quartz Composer book has been long desired by the real-time video community, given the combination of its unique capabilities and severely undercooked documentation online. Hats off to Graham and Surya for rising to that challenge, and helping expose QC’s potential for visual artists of many flavours. These days a book inevitably also means an accompanying DVD of video tutorials (which can also be accessed online by those who buy the PDF, book code needed), and an extended support website (ILoveQC). According to the authors – Maker types /Motion graphics designers, film makers, VJs, artists, interactive programmers, and Cocoa developers. If that’s you – this book will help – “…even the unsophisticated user into creating art projects, visuals for a band or party, wild Preface screensavers, and RSS-powered trade-show kiosks. 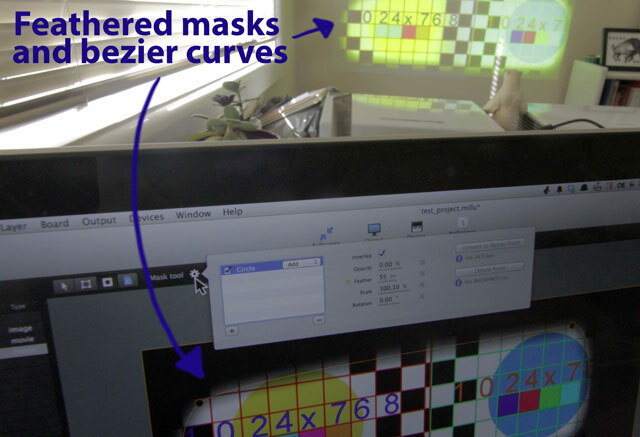 For anyone with a programming background, the material quickly opens up a new world of visual potential”. the composition process in QC, explained relative to composition software such as After Effects… giving a bit more of an explanation of how the overall 2D / 3D possibilities work, and how they could be utilised / explored in many directions.. This book fills a great gap in learning resources for Quartz Composer.. so hopefully rumours of QC’s gradual demise stay that way, and some of the recent flourishing of QC activity ( as an interactive prototyper / and as discussed on the very active Quartz Composer Facebook group ) continues on. 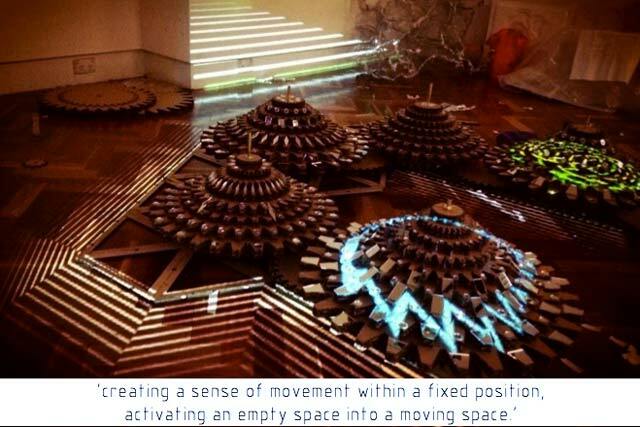 Ok, ENESS – you had me at ‘projection mapped kinetic sculpture’. The Creation Cinema – seen above, is now installed at the Melbourne Museum as part of First Peoples, an exhibition celebrating ‘the history, culture, achievements and survival of Victoria’s Aboriginal people.’ It’s a gorgeous installation, located inside a circular room, which is in turn enclosed by intricate layers of wood. Once inside – the sublime smoothness and grace of motion immediately captivates. It’s something that animators strive for with onscreen movements, but is so much more satisfying to witness with moving physical parts. Within that darkened egg of a room, the sounds, video and slow relentless movements of the wing fragments all add up to quite sublime effect. Fantastic installation, and viewable for the next 10 years! Other projects by ENESS: A Tilt of Light (cleverly adapting a seesaw), an interactive skate-ramp for the TRON sequel. Sampology at Falls Festival Dec 30 ( Marion Bay ) + Dec 31 ( Lorne ) ( Mixing camera sources with Sampology’s live video). Developed an audiovisual performance with The Swiss Conspiracy ( Moses Iten from The Cumbia Cosmonauts, and Christoph H. Müller from Gotan Project ) , which was performed at The Swiss Festival. The show ended up featuring footage shot at Alpenrail, the largest Swiss Alps railway model replica in the Southern hemisphere ( gopro train tunnels! ) and goats from a Swiss goat cheese farm SW of Hobart. Rebirth of A Firebird – Helped out with some live projections for a couple of sequences for a ‘hip-hop sci-fi’ short film being made by Alan Nguyen (aka 2 Pants Rotation – in his giant monster rapping mode). At the Adelaide Festival – did live video for The Cumbia Cosmonauts at the fun pop-up venue, Barrio. The theme for the night was ‘Animal House’ – which meant there was a camel, piglets and geese nearby, as well as dog masseur doing live demonstrations on a table. – Developing an audiovisual performance for Wide Open Spaces, a wonderful desert festival held out near Alice Springs in May. Longtime collaborator Suckafish P Jonez is back from Barcelona, and we’re excited to be exploring AV again. Weekly rehearsals! – Am co-hosting a studio elective at RMIT within the design faculty, looking at video production, projection and installation – from an interior design perspective (which tends to include a lot more materials and building related research / development). It’s a fun studio, which uses mapping processes, and comic / graphic novel storytelling techniques to help inform video installations. – Am slowly rolling out a series of updates to the skynoise.net/projects page, finally uploading documentation from a range of projects… including the snippets below, developed for 360 last year. FACE IS THE PLACE : ((Finally succumbed – click facebook.com/JeanP00LE – for all your Zuckerborgian messaging / subscribing / liking needs)).